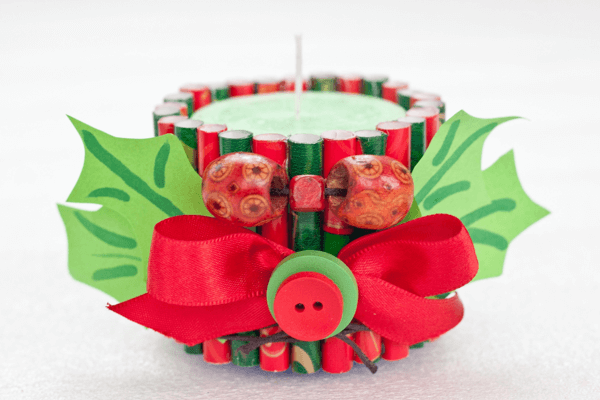 For this project, we will buy a standard candle and then decorate it in a festive manner. These decorations are easy to make and the sky is the limit. Your only limitation is your own imagination. So, what do we need to get started? I like to use whatever candle I have available. Any short pillar candle will do, but if you like scented candles, then why not get one of these divine root scented candles from Amazon. They have a wonderfully earthy smell. Firstly we will make the “candle cup” from wrapping paper. Then we will add a red bow, or any color that works with your holiday color scheme. We will then add the leaves, buttons and beads. Cut the wrapping paper into long strips based on the height of the candle that you want to cover. Then cut these strips into 1.5 to 2 inch widths. The width will depend on how big you want the rolls to be. Roll up these strips of wrapping papers. Take care to roll them to roughly the same thickness and then hot glue the ends of each roll to secure them into small wrapping sticks. 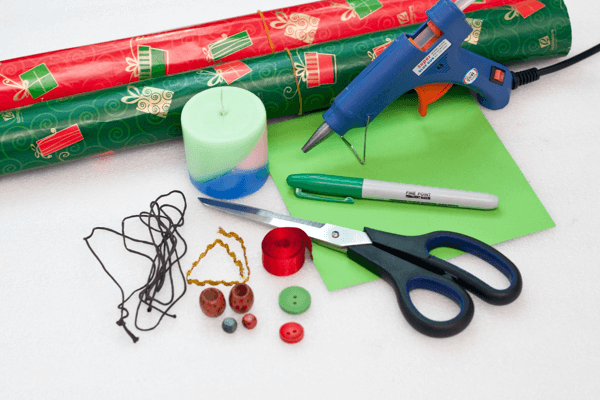 Use the hot glue gun and stick these wrapping sticks together side-by-side. Now this is where you can get creative with the look of your “cup”. I usually alternately the sticks between the different color or design wrapping paper. Glue enough sticks together for your candle to fit into comfortably but snugly. Insert the candle into the wrapping stick “cup”. Wrap the red satin ribbon around the candle and fold a bow. Trim off the excess ribbon from the bow. Cut four randomly sized holiday leaves from the green construction paper and draw veins onto the leaves with the green Sharpie. Place one leaf on top of the other in a V-shape and glue them together. Hot glue the one set of leaves on the back of the left side of the red bow and the other to the right side of the red bow. Place the smaller wooden button on top of the bigger wooden button. Hot glue the buttons in the middle of the bow. Insert the beads on the thin jute or twine and wrap it around the body of the Christmas candle. Then tie it tightly around the candle to make sure that the beads won’t fall off. Now that you know how to make a festive advent candle, why not gather all your plain candles and turn them into festive advent candles. Not only are these amazing for your own home, but they are also great as gifts to your loved ones. Glowing Holidays is a participant in the Amazon Services LLC Associates Program, an affiliate advertising program designed to provide a means for sites to earn advertising fees by advertising and linking to Amazon.com. Some links on this site may lead directly or indirectly to affiliate offers. The owner of this site may receive compensation if a purchase is made using a affiliate link from this site. The owner of this site does not make any guarantee concerning these offers and all offers should be viewed as recommendations only. Copyright © 2019 Glowing Holidays. All Rights Reserved. The Magazine Basic Theme by bavotasan.com.